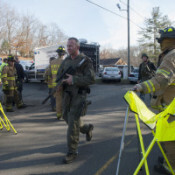 NEWTOWN, Conn. (CBS Connecticut/AP) — CBS News is reporting that at least 27 people are dead, including 20 students, after a mass shooting at the Sandy Hook Elementary School in Newtown. The gunman is among the dead. CBS News reports the gunman, now identified as 20-year-old Adam Lanza, was the son of Nancy Lanza, a female teacher at the school. She was found dead at her Newtown home. A law enforcement officer originally told CBS News that Nancy Lanza was among the dead at the school. New Jersey State Police have Lanza’s older brother, 24-year-old Ryan, in custody in Hoboken. WCBS-TV reports that Ryan Lanza is being cooperative with authorities and that he hasn’t been in contact with his brother for a few years. A law enforcement official told The Associated Press that Adam Lanza’s girlfriend and another friend were now missing in New Jersey. Lanza opened fire with two handguns inside two classrooms, one of the classrooms being his mother’s. CBS News reports that Lanza killed himself at the school. The Associated Press quoted an official as saying the suspected gunman drove to the school in his mother’s car. Another law enforcement source earlier told CBS News that a Sig Sauer, a Glock 9 and a Bushmaster rifle were found at the scene. The AP reports that the three weapons found at the scene were registered to his slain mother. “The shooter is deceased inside the building,” State Police Lt. Paul Vance said during a press conference on Friday afternoon, adding that the scene had been secured. Post Continues: CBS News: 27 Dead, Including 20 Children, In Elementary School Shooting « CBS Connecticut.